Drafting Steals: What is Heavy Vellum Paper? What is Heavy Vellum Paper? Vellum has been in use since at least the second century B.C. It was allegedly invented by Eumenes II of Pergamum. Because the Ptolemies of Egypt wouldn't allow papyrus to be exported, Eumenes found a method to turn the skins of stillborn lambs and calves into writing material. The skins were washed, scraped and cleaned then placed in vats of caustic lime for many days. After that, the remaining hairs could be removed. The skins were then scraped some more, washed many times and then stretched over a frame to dry. The drying process took weeks, and during that time the skins were scraped down some more and made even with a sharp knife. After they were dry, they were rubbed with pumice and dusted with chalk. When used, traditional vellum was written upon on only one side, which was called the recto of the skin. The lines ran the entire width of the roll of vellum, and the roll had to be unfurled from top to bottom to be read. 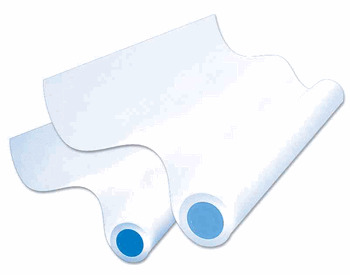 Nowadays, what's called heavy vellum paper is made out of cotton that's been plastericized. This makes it translucent and frees it from the problems found in animal skin vellum. This includes cockling, which means that the paper puckers up due to changes in temperature and humidity. The size of the page remains stable. Because vellum can be seen through, it's an excellent paper for overlaying, tracing and reproducing the drawings of architects and engineers onto blueprints. Floor plans of houses and office buildings are often drawn on vellum. It's also an excellent educational tool when it comes to teaching students the finer points of drafting and drawing. Vellum can be drawn on manually and special types of vellum can be used in printers and plotters. It usually comes in sheets, pads or rolls. Vellum can also come with or without grid-lines for ease of use. It can also be printed with a customized title block.